ATI offers districts and charter schools libraries of pre-made assessments that may be used with students. Two examples of such libraries are the TE Formatives and the MAZE Reading Fluency Online test libraries. The TE Formatives library provides tests composed of technology enhanced items that assess one strand, concept or standard. The MAZE Reading Fluency tests can be used to measure students’ reading fluency and to track students’ growth in reading ability over time. Once assigned to your district or charter, these formative assessments may be previewed and scheduled by teachers from their class calendar page. Contact ATI’s Educational Management Services Department to request access to the desired formative libraries at 800.367.4762 or EdMgtSvs@ati-online.com. To learn more about using Instructional Dialogs, please contact our friendly and knowledgeable Field Services Coordinators GalileoInfo@ati-online.com. Thanks to all who attended, this informative and timely seminar was a big success. 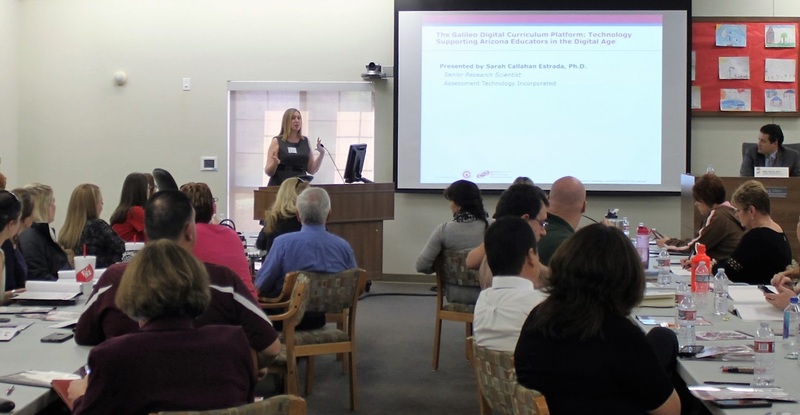 The event, which was co-hosted by Chandler Unified School District (CUSD) and ATI, provided a first-hand look at how Arizona educators are taking the lead in utilizing the teacher-friendly innovations of the new Galileo Digital Curriculum Platform. 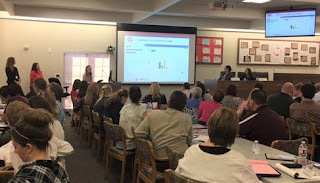 Attendees viewed presentations from the cohosts and engaged in the "Arizona Round Table Discussion" that included education leaders from CUSD, Crane Elementary School District, and Maricopa Unified School District. The round table participants provided their reasons for adopting the new platform along with discussing their experiences, successes, and next steps. Access to the presentation materials is now available. We invite you to view and share them with colleagues. For answers to any questions about using the Galileo Digital Curriculum Platform in your district or charter, email us or call 1.800.367.4762. 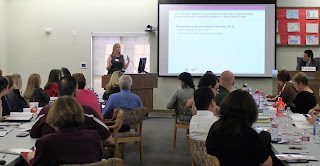 CUSD presenters share their experiences of implementing the Galileo Digital Curriculum Platform. Approximately 800 new high-quality items are added to Galileo item banks every month. This fete is accomplished by our experienced, in-house Assessment and Instructional Design team. The team of item development experts use ATI’s multi-stage process which is based in research and reflects industry best practices. The process takes into account principles of Universal Design and has been carefully designed to produce high-quality items including selected-response, technology enhanced, and constructed-response items as well as performance-based and project-based assessments. The item development process includes the development of item specifications, item construction, item review with certification, and field testing of items including empirical validation of item quality using Item Response Theory. The first step in ATI item development is to review the standard and the component skill to be assessed. This skill is the starting point for developing an online list of item specifications defining the characteristics of a class of items to be written. Item specifications indicate the defining characteristics of the item class, the rationale for the class, and the required characteristics for each item component. Specifications might also address such factors as the cognitive complexity intended for items included in the specification class, the appropriateness of vocabulary, and Lexile® measure requirements related to readability levels. Item specifications may also be designed to align very closely to guidelines and released items from statewide assessments and assessment consortia (e.g., Partnership for Assessment of Readiness for College and Careers [PARCC], Smarter Balanced Assessment Consortium [SBAC]). The value of creating specifications as a guide for the item development process is recognized as a critical part of a process documenting that assessments are reliable and valid indicators of the ability they are intended to measure (Haladyna, 2004). Their structure and specificity also afford many advantages for ensuring that item specifications may be readily evaluated for purposes of mapping items to new or changed standards. After specifications have been written, items are constructed corresponding to the specifications using the online Bank Builder utility. Bank Builder includes features that promote item quality. For example, images constructed using Bank Builder conform to size and resolution standards that yield items that are visually suited to online and offline administration. Similarly, fonts available in Bank Builder are chosen to work across platforms, for readability both onscreen and in printed material. The initial review process for item specifications, items, and item families occurs in-house and is composed of ATI review of the item specification, ATI review of the item (and passage/text if applicable), revision (if needed), and finally item certification. The item review process continues once a certified item is made available for use in an assessment. Items placed in district designed assessments are subjected to review by each member of the district’s review team during the test review process. The district may suggest item changes, if desired. The combination of a multi-material (specification, item, and item family) multi-step internal review accompanied by continuous external review by educators provides a rigorous approach to evaluation producing assessments that meet local needs and that are highly effective in forecasting and guiding instruction toward standards mastery. ATI through Galileo supports multiple approaches to field testing items based on the specific goals for the field test. As one option, ATI through Galileo supports the development and administration of field test assessments including the desired field test items. 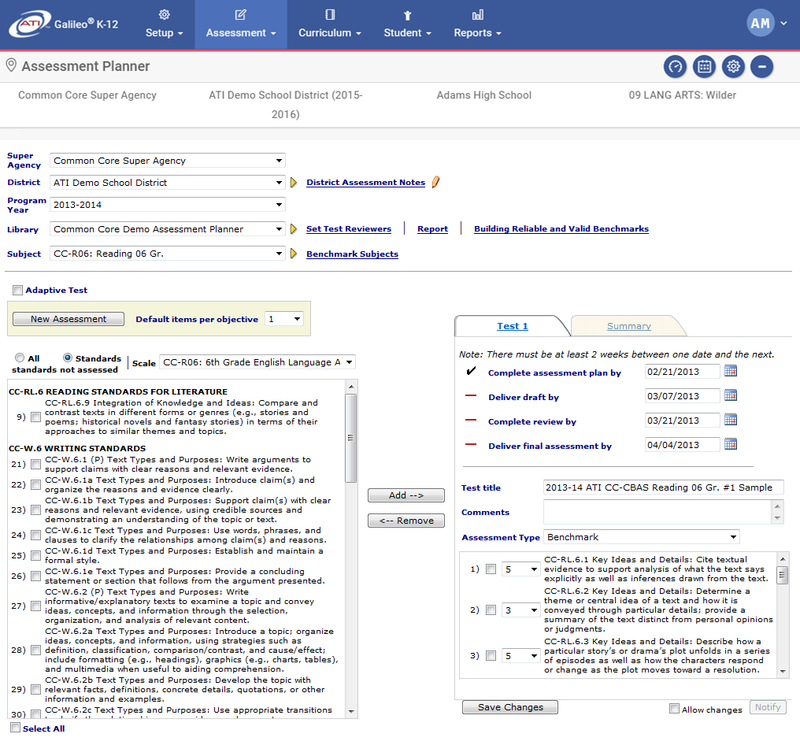 As another option, Galileo supports the inclusion of new items on district assessments as soon as they are developed (i.e., within the same school year). 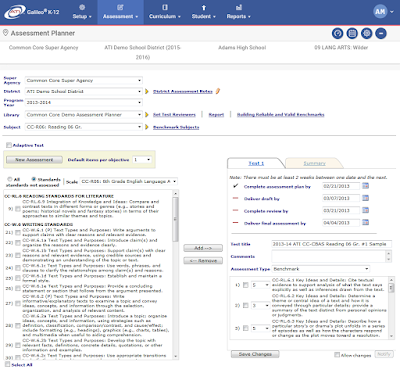 This approach accommodates district needs related to the rapid development and delivery of new items in response to statewide assessment changes (e.g., deployment of new item types) and district feedback/requests (e.g., wording or formatting changes to more closely match instruction). Regardless of the approach, ATI can conduct IRT analyses to evaluate the characteristics of field tested items (e.g., discrimination, difficulty, pseudo guessing [where applicable]). Access the Multi-Grade TE Items Sample for a look at some of the items that have made the cut. Schedule an overview to learn how Galileo can meet your specific district/charter assessment needs. 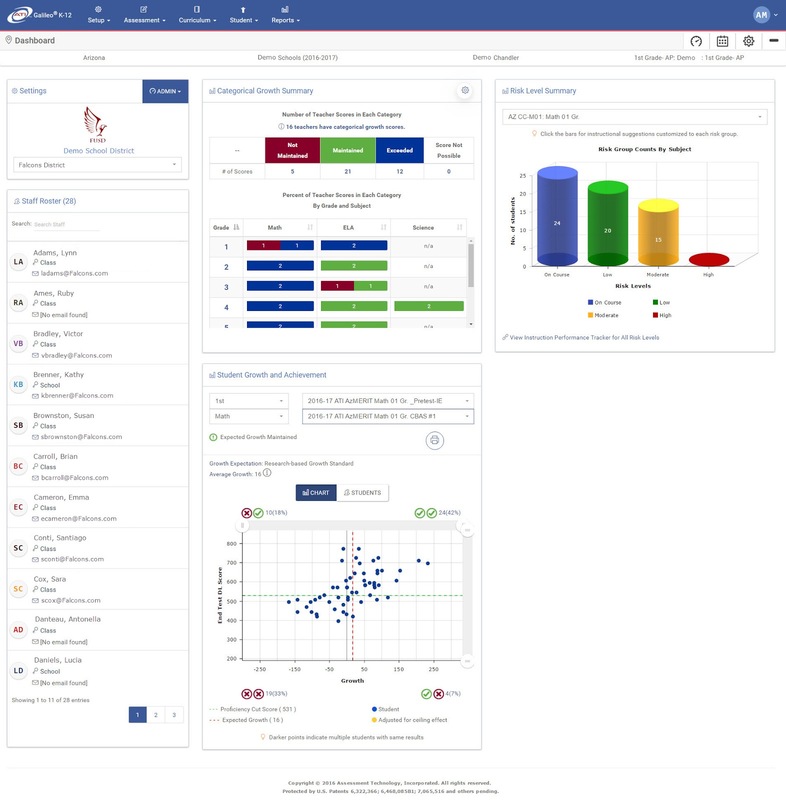 Galileo dashboards, including the newly released Admin Dashboard, provide all stakeholders access to intervention tools that assist in improving student achievement. 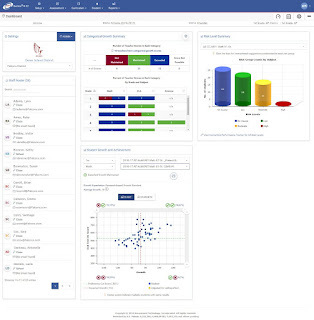 The Admin Dashboard, one of the exciting recent innovations from ATI, contains all of the functionality of the School Performance Dashboard it replaces. It also offers one-click accessibility, responsive design, efficiency, integration, smart technology, and convenience. These features support ease-of-use and accessibility from a variety of devices ensuring that tasks can be easily completed at any time and from any location. 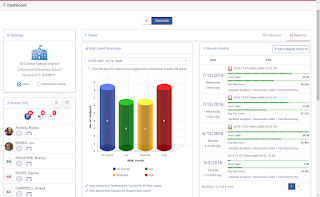 The Admin Dashboard supports the monitoring of student growth and achievement along with providing intervention activities at the school- and district-level. Quick access to intervention tools are found in Galileo Admin Dashboard. Learn more about the Galileo dashboards by scheduling a Galileo Overview. Contact one of our friendly Field Services Coordinators to experience Galileo for yourself. To assist Assessment Technology Incorporated (ATI) district and charter school partners in preparing students for statewide assessments incorporating item types using online technology, ATI is continuing to expand our offering of technology-enhanced (TE) items. ATI is producing TE items for use in secure district-wide assessments as well as content for formative uses that can be included in instructional materials, quizzes and class tests to allow students and instructors to become familiar with these new item types. ATI TE item types include items modeled on released item examples, and innovative designs from our professional staff of experienced item writers. Our writing staff has added 14,000 TE items to the bank and continues to add 400 TE items per month to promote student proficiency with these item types. For a demonstration of these item types please contact ATI Field Services. All stakeholders have access from Galileo Dashboards to intervention tools that assist in improving student achievement. 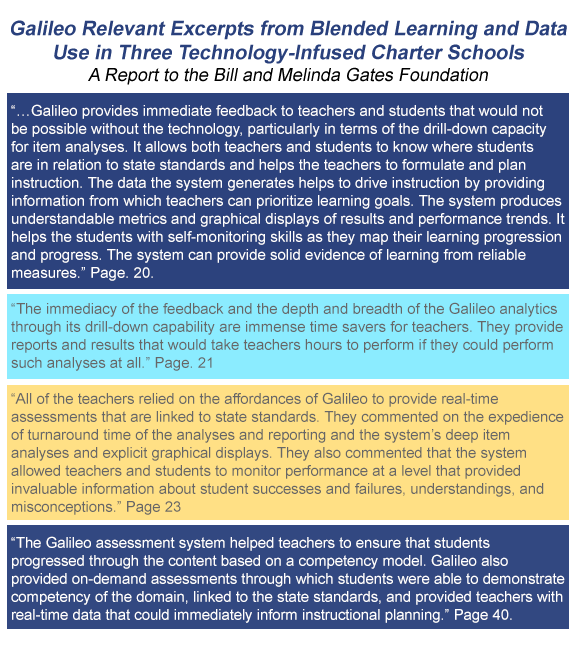 ATI is in the process of making a number of exciting enhancements to the Galileo K-12 application including to the Teacher Dashboard and Admin Dashboard (formerly the School Performance Dashboard). These enhancements benefit users by offering one-click accessibility, responsive design, efficiency, integration, smart technology, and convenience. 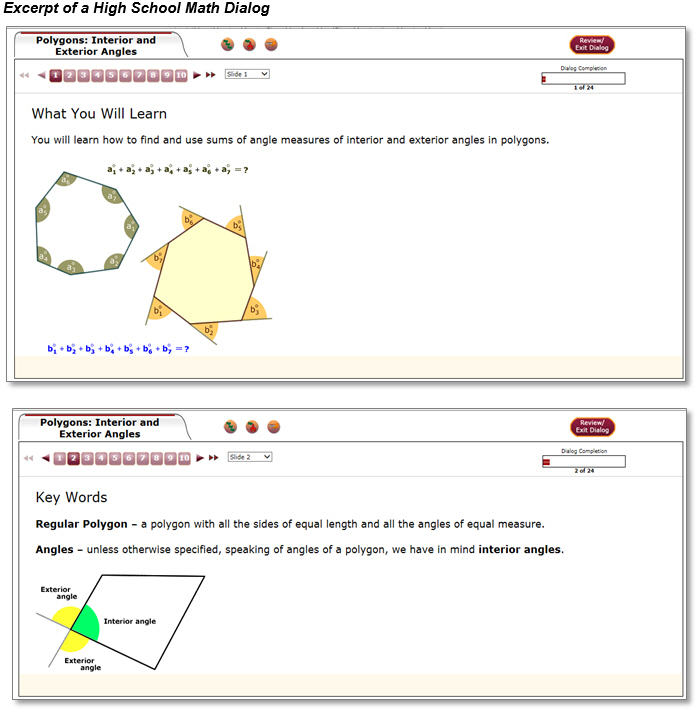 Many educators are looking for a quick method to access enrichment and remediation activities. 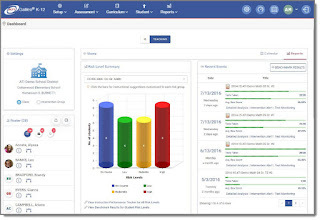 The new Teacher Dashboard, now available to all districts, makes it easier than ever for teachers to access actionable assessment information along with recommendations for student groupings, targeted standards for differentiated instruction, and links to standards-based instructional materials (e.g., Instructional Dialogs, materials from KHAN ACADEMY®). This can easily be done via recommendations in the Instruction Performance Tracker and the Intervention Alert Reports. As shown in the following screen shot, both reports are accessed via drill-downs from the Teacher Dashboard. View a brief tutorial covering the new Teacher Dashboard also access it and other videos from YouTube. View a 30 minute webinar on Galileo's enhanced interfaces. Revisions to the Admin Dashboard are nearly complete and will be released soon. 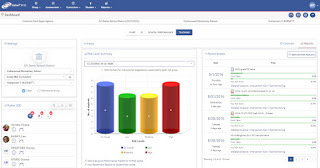 The Admin Dashboard supports the evaluation of student growth and achievement, along with intervention activities at the school- and district-level. The Admin Dashboard will include similar enhancements found in the Teacher Dashboard to help improve the ease-of-use and accessibility from a variety of devices. 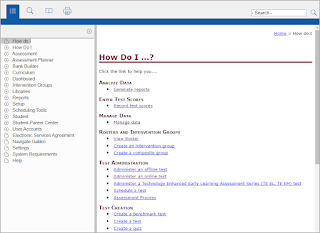 The following screen shot offers a peek inside the new Admin Dashboard. Contact a friendly field services coordinator for a demo or further information. Our Assessment and Instructional Design staff have extensive experience aligning item banks and curricular materials to rapidly changing standards. We are well-positioned to remap items, assessments, and instructional materials to support the adoption of new state standards. This allows educators to find the items they need in Galileo® that will engage students in complex thinking to promote college and career readiness, evaluate standards mastery with high levels of rigor, and prepare students for success in responding to the types of items they will encounter on statewide tests. Galileo item banks in total are comprised of over 70,000 items (including more than 13,000 technology-enhanced items), and are among the largest secure (district level) and community (class level) item banks in the nation for use in math, reading/English language arts (ELA), science, and writing assessments in grades K-12. ATI content specialists create new items continually (on average about 800 new items per month). Unlike systems delivering static item banks validated with a single student sample at a single point in time, Galileo items are developed and psychometrically validated on an ongoing basis. 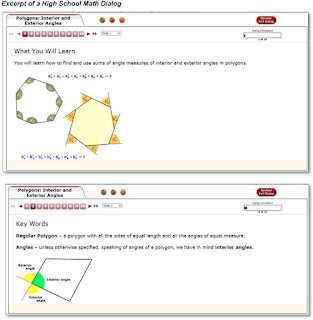 Item types include selected-response (e.g., multiple-choice, true/false, yes/no), constructed-response (e.g., essay with scoring rubric, short answer), and technology-enhanced (e.g., selectable text, multi-part, expanded selected-response, sequencing, interactive, customized technology-enhanced) items as well as performance-based tasks/assessments. All Galileo items and passages/texts are created, aligned to standards, placed under review, and then certified for use according to strict guidelines. Each item is classified in multiple ways (e.g., grade level, standard, Depth of Knowledge [DOK] level). Plus, with our partnership with Key Data Systems (KDS), we are able to offer access to the KDS Inspect® item bank and a suite of over 300 pre-built assessments. The Inspect item bank is comprised of over 33,000 items for ELA (K-12) and math (K-12). In addition, science (4-HS) and history/social studies (5-HS) are also available. Schedule an overview to learn more about Galileo’s extensive item banks. We at ATI have made several enhancements to Galileo K-12 Online interfaces which provide benefits to users at all levels. Join us September 14 at 2:00 pm EDT for a complimentary webinar offering a brief overview of the robust features of Galileo focusing on new interfaces including a streamlined menu bar and an easy-to-use Teaching Dashboard. These latest enhancements were designed specifically with teacher use in mind. It is now easier than ever to build and administer curriculum materials and assessments as well as to access data which can inform next instructional steps to promote learning. Additionally, participants will view the redesigned student testing interface through the K-12 Student-Parent Center. The sleek interface is designed to easily communicate information between students and teachers and between teachers and parents. Communications to students and parents can focus on curriculum and instruction including scheduled lessons and assignments, on assessments and assessment results, and on instructional resources for home use. The enhanced K-12 Student-Parent Center Dashboard includes user-friendly icons, responsive design accommodating use on various screen sizes, search capabilities, and the integration of Google Translate. Register for the complimentary webinar today! Districts and charters have the option to begin using the new Teaching Dashboard now or later in the year. Learn more about making the switch during the September 14 webinar. Galileo K-12 Online help is within reach. When working in Galileo K-12, just click the User Options/Help menu and select Help. With a click of the mouse or a finger tap on a tablet you have a wealth of information to help you use Galileo effectively and efficiently. If you prefer, you can use the Search tool to immediately access a topic. Just type the desired search words in the Search box on the right side of the page or click the magnify glass icon on the left side then press enter. The results will show you everywhere the word(s) appear in the help files. Many industries have their jargon and abbreviations. Education is no different. ATI has included a Glossary to help you understand key words and concepts referenced throughout the application. Click the book icon located in the upper left corner and locate the term along with the definition. Once you have accessed the desired topic, you can follow the directions, print out the directions, open quick reference guides and view videos. Galileo's two newest interfaces are now live. ATI is excited to provide the streamlined menu bar and Teaching Dashboard each offering a fresh look and enhanced functionality. The new interfaces offer many user-friendly features such as one-click accessibility, responsive design, efficiency, integration, smart technology, and convenience. The new menu bar is being used by everyone at this time. Districts and charters have the option to begin using the new Teaching Dashboard now or later in the year. We encourage you to preview the new Dashboard and see for yourself how easy it is to both build and administer curriculum materials and assessments as well as to access data to inform next instructional steps for promoting learning. 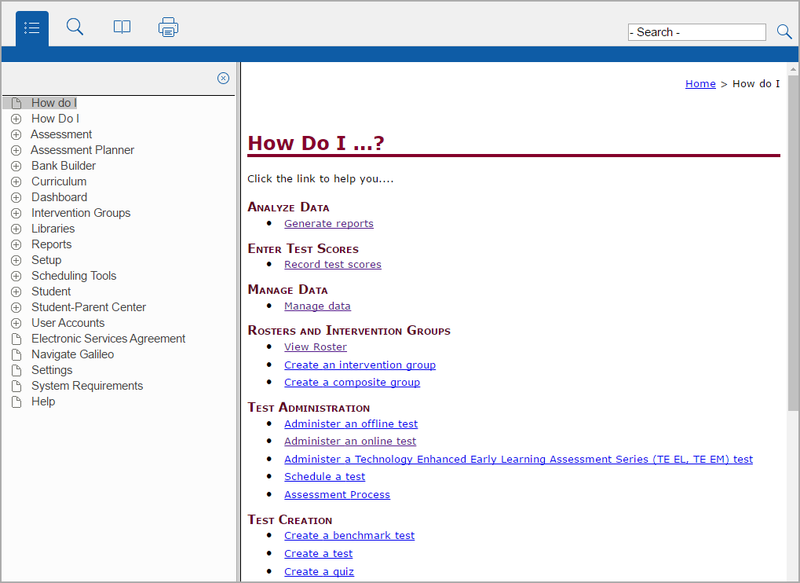 Quick reference guides (QRG) offering step-by-step illustrations of the menu bar and Teaching Dashboard. Teaching Dashboard user friendly interface. EMS staff works closely with district personnel to ensure that the resulting benchmark assessments are of the highest possible quality. Of course, quality requires time so we ask that you please allow for a 2 week delivery window for pre-made assessments and a 6 week window for assessments aligned to district curriculum.